US banking giant Wells Fargo is still being haunted by its actions in the run up to 2008 financial crisis. The bank's latest results were hit by a $1bn charge to cover investigations into its mortgage underwriting practices before the crisis. Wells Fargo said third quarter net income fell 18% to $4.6bn (£3.5bn). The bank is also reeling from last year's revelation that staff created as many as 3.5 million accounts without the permission of customers. 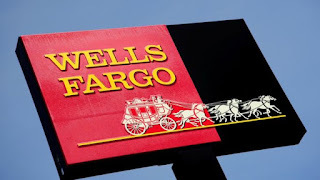 In September last year, Wells Fargo was fined $185m over the illegal accounts, a scandal which cost the then-chief executive John Stumpf his job. Wells Fargo fired about 5,300 employees in connection with the scandal. "Over the past year we have made fundamental changes to transform Wells Fargo as part of our effort to rebuild trust and build a better bank," said chief executive Tim Sloan in a statement with the latest results. Wells Fargo also reported falling sales. Revenue dropped 2% to $21.9bn, not helped by a big fall in income at its mortgage unit.